Most of us start out with a simple train set. Typically these sets include an oval of track to get you started. Watching your train run around in an endless oval will get boring pretty quickly. When you're ready to move on to your first layout, adding a few switches and some additional track will go a long way toward holding your interest. The 4x8 platform is a common layout size, especially for a first layout. Construction of the platform itself is straightforward. The plan shown in Step 1 provides a level track bed for easier construction and operation. You could add a sense of topography with the scenery. Just be sure to seat the buildings' foundations into the contours of the terrain. Given the open nature of the platform, putting a view block of tall buildings, a mountain or even a ​backdrop down the center could go a long way toward increasing the apparent size of the layout and placing some distance between operating districts on each side of the layout. This track plan is designed around standard track sections and switches. The switches shown in the plan use the same 18" radius curve as traditional curve sections. More conventional "Number 4" switches could be substituted with additional curve pieces to match. 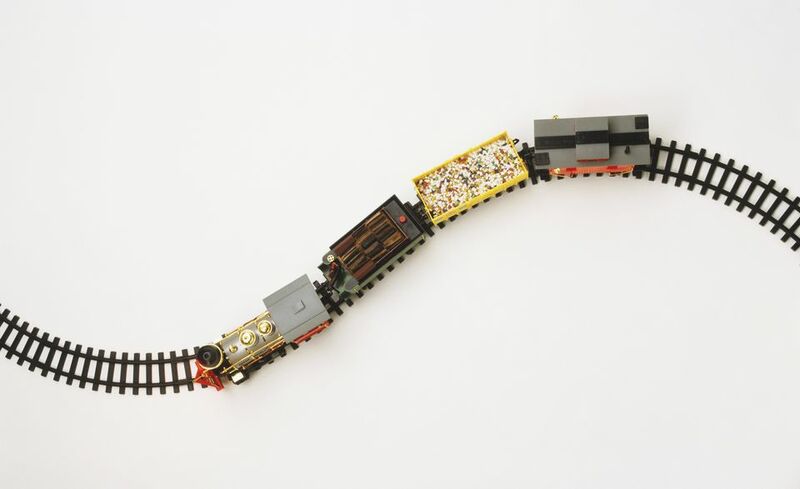 You could also substitute flex track for most of the track on the layout. Flex track will allow more options for track alignment but track sections will allow you to move pieces around and change things as you go. Your train set probably already includes 12 of the curve sections and at least two of the straights required. There is room to add additional yard tracks or sidings elsewhere around the layout if desired. Placing the oval of track on an angle helps with scenery and visual appeal as track usually looks better when it is not parallel to the edge of the platform. Scenic options on this layout are wide open with a lot of room in the center of the oval. There is still a little room around the edges for some simple scenery as well. The spur leading to the edge of the layout will be used to represent an interchange with another railroad. Although a bumper track was not shown here on the plan to help suggest the railroad doesn't end at the table's edge, you will want to put some sort of barrier at the end of the line to protect your trains from a trip to the floor. The other two spurs could represent any industries you'd like. Using the siding in the corner opposite the interchange as a "team track" will allow virtually unlimited car spotting options and won't require a building with a large footprint. Although it is still just an oval, the addition of several sidings will give your train something to do as it works its way around the railroad. Two of these sidings can be used as industries. The third, extending to the edge of the layout, represents an interchange, or connection with another line. The double-ended siding next to the interchange is a runaround track to allow you to serve both of the industries whose switches leave the mainline in opposite directions. Begin your run by picking up an inbound car at the interchange. Travel to the other side of the railroad where the car must be set out at one of the sidings. There may be a car on one or both of these tracks to pick up as well. You may need to head back around the corner to the run around the track to get the locomotive on the right end of the car to switch the siding. Deliver your new cars to the interchange to complete your day on the railroad. You could use a car-forwarding card system to set up operating moves, or just set up a train with a few random cars and head out on the line to make your pick-ups and set-outs as you see fit. With any layout, spending a little extra time to ensure your track is laid well, and powering switch frogs will go a long way towards increasing your enjoyment. Uncoupling magnets on the sidings would also make switching easier. Most switches are within easy reach so simple ground throws could be used. Powered switch machines are always an option however if you prefer. Despite a relatively simple plan and only a few sidings to work, you'll find this layout provides much more operating interest than just watching the train chase its caboose. Using sectional track, it would be easy to move a few sidings around to change the operating pattern later. Or perhaps you'll decide to expand your empire by building on to the platform. The interchange track provides a natural place to grow.